I've been spending a fair amount of time on the Sky Shredder lately. I'm starting to wonder whether Bioware didn't tweak its chances to come up in the rotation for the duration of this patch after all, what with how often I've seen it pop recently instead of other warzones. I stand by what I said a month ago about it being quite a fun warzone, but what's been even more entertaining to me has been watching the gradual evolution of the Huttball meta. Shortly after I made my original post it came to my attention that there were people out there who claimed that the additional traps to slow down scoring were ineffective because supposedly it was easier to score quickly on Vandin than it had ever been before. Why? Because you could just leave a stealther to lie in wait at the enemy line, so that whoever picked up the ball can just jump into the pit, pass up, and boom - job done. They are not wrong that this is something that can be done, but it's certainly not unique to Vandin - this has been a possible way of scoring in the original Huttball since launch, but it kind of fell out of favour over time, so it was interesting for me to see the Skyshredder cause a revival of that strategy. Basically, for all its efficiency when done right, there are several downsides to this "going through the pit". - It does require a minimum of two people to co-ordinate. 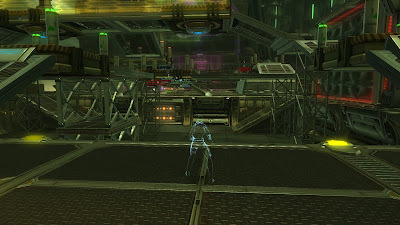 That may not sound like much, but we're talking pugs here... if you're a good player who knows how to chain cooldowns and are able to run to the line all on your own, you don't have to rely on anyone else on the Nar Shaddaa map. - Even if you have two players willing to co-ordinate, if the ball gets picked up by another team member who doesn't pay attention to what's happening, the plan might not work. - Worse, if the enemy picks up the ball first and starts running, the person waiting at the enemy line is miles away from the action and effectively not contributing. - The person waiting at the line has to be willing to give up chasing kills and generally engaging in actual PvP, something that (understandably) doesn't sit well with a lot of PvPers. I was in a match the other day where we won in the "classic pit" with this strategy, and the guy who had been waiting for the passes finished the match with nearly 20k objective points but literally zero damage or healing. - For this tactic to work effectively, you need the person lying in wait to be a stealther, which greatly limits the class selection. In theory you can have a non-stealther stand around and wait for a pass (and I've successfully done that too), but for that to work successfully for any length of time it requires the enemy team to be seriously oblivious. - Once the enemy team catches on to what's happening, it's not hard for them to interfere. Knocking the intended recipient of the pass back down is the obvious and most effective counter, but even if you don't have a knockback you can try to stun them at just the right moment to cause the pass to fail, or hell, simply stand on their head and their chances of success go down to at least 50-50 as you might intercept the pass simply by proximity. I was seriously impressed one time when the second I came out of stealth on the line, a warrior leapt at me and managed to intercept the pass intended for me right in front of my nose. - If the intended recipient of the upwards pass gets knocked down, killed, or it becomes otherwise impossible to safely pass to them, the person stuck at the bottom of the pit is in a very crappy situation, and unless they are on a class with a leap they'll probably die. In other words: passing through the pit is an age-old tactic that can work very well but it's also susceptible to all kinds of issues. And that's what makes it fun! Quick passes and trying to mess with people who try to make them is what Huttball is supposed to be all about. The other day I had a match where both teams were really good at this and the game ended with no less than 15 goals scored. You bet that never got boring or tedious. We'll see how long people's preference for this scoring method will stick around before things get changed up again.